AMADYS, 30 years old, was founded in 1987 and is the French association for people with dystonia. 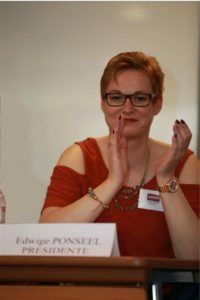 Edwige Ponseel is the President since 2016, and the board consists of 10 other elected members. The association has 1600 members and 90 local representatives throughout France. Its objectives: raise the awareness of dystonia among the medical profession and the general public, support patients and their families, organize meetings of patients as well as scientific symposiums and to support research. AMADYS is supported by a scientific committee chaired by Professor Mary Vidailhet and comprised of 25 representatives of various medical specialties within dystonia. The committee is involved in various areas such as analyzing the on-going research, answering medical questions from members, participating in scientific conferences at both national and international level, as well as in the publishing of scientific articles in the association newsletter. A magazine, published three times a year, and various leaflets are available for members. A fellowship for medical research, the Breughel Price, is awarded every two years. Over the past 10 years, the association has funded over 15 projects in the fundamental and therapeutic research. Thanks to donations, AMADYS was able to invest more than € 250,000 in research.